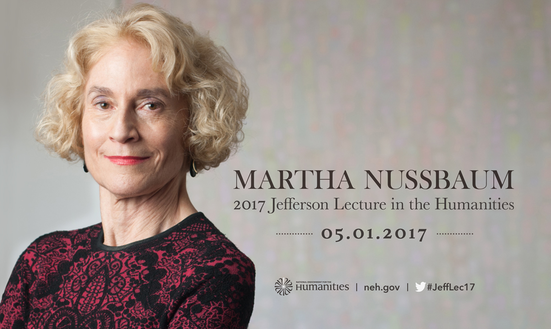 Washington, D.C. (January 18, 2016) – Martha C. Nussbaum, world-renowned philosopher, distinguished author, and law professor, will deliver the 2017 Jefferson Lecture in the Humanities. Her Jefferson lecture topic, “Powerlessness and the Politics of Blame,” will draw from her latest book project. The project brings a philosophical view to political crises in America, Europe, and India by offering a deeper understanding of how fear, anger, disgust, and envy interact to create a divisiveness that threatens democracy. She will also cover the role of emotion in politics in order to explore the emotional dynamics at play in American and other societies today—including the ways in which uncertainty leads to the blaming of outsider groups.